Bluefields, the main town in the province, issued overprints fom 1904 until 1911 (Sc-1L1 to 108, SG-B1 to B111), as did the Cabo Gracias a Dios (Cape Thanks to God) district, which included the port of that name (Sc-2L1 to 2L72, SG-C1 to C72). 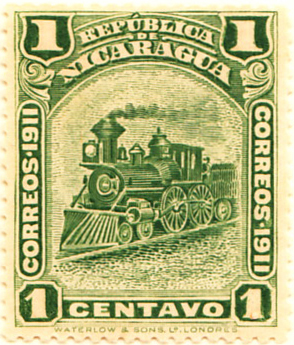 In February 1912 a general issue was made (SG-Z1, first issue shown) and later that year the gold cordoba was introduced throughout Nicaragua, so provincial stamps were no longer needed. Scott lists the general issue under Bluefields. 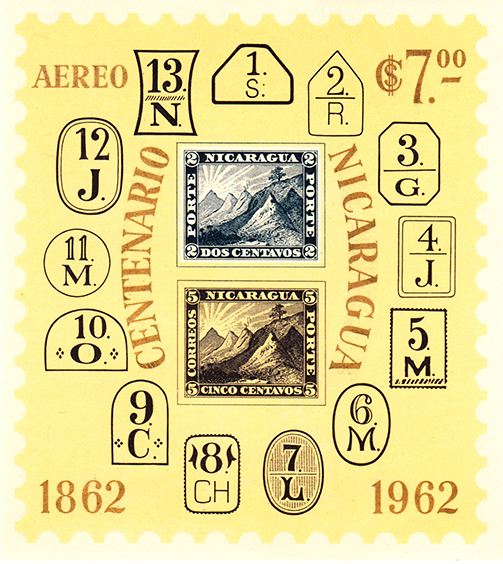 For the centenary of its first stamps, Nicaragua issued a rather nice miniature sheet in 1962 showing the two stamps and early postmarks. “…your perf.12 information listed on it is incorrect. The first printing (by ABNCo) in 1862 was perf. 11.6 X 11.6. By the time additional printings were made of it (including reprints on the original issue paper for collectors) and the other denominations added, ABNCo. switched to a new machine. These produced 11.85 (all denominations) and some 11.85 X 11.95, 11.95 X 11.95, 11.95 X 11.6 and 11.95 X 11.85.